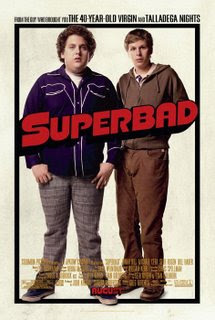 Two high school best friends forever (Jonah Hill, Michael Cera) go on a mission to provide alcohol for a graduation party in hopes of losing their virginity.After facing the fact that both Seth [Jonah Hill] and Evan [Michael Cera] will both be going to different colleges next year, it seems more imporant than ever that they go to a high school party, and achieve some of their long time goals; including, but not limited to, losing thier virginity with the girl of their dreams by getting them wasted and being their "regret hookup." Their awkard friend Fogell [Christopher Mintz-Plasse] gets a fake ID, with just the name McLovin [it was either that or Mohammid], and agrees to get liquor to bring to Jules' [Emma Stone] aka Seths dream girl's graduation party. All seems to be going well until McLovin is suckerpunched in the liquor store by a robber. When the police come, they try to get a story out of the clerk, but she is too worried about her exam tomorrow, so their question McLovin, which they give offer to give a ride home [more hillarity ensues].